Many adventurers have met their end falling from the PAIN CLIFFS. Pain Cliffs is zone 2 of world 2 of Super Adventure Box. There are 9 Hidden rooms, 42 Baubles to collect and 100 Assassins to kill. This level introduces dissolving clouds and icy surfaces. Search YouTube for videos related to World 2 Zone 2. Search YouTube for videos related to World 2 Zone 2 Tribulation Mode. This was done on Infantile Mode to collect all Baubles, Hidden rooms, Furniture Shops, and to kill all the Assassins. Additionally, players must have the Glove of Wisdom, Mini Bomb, and Wooden Whistle in order to collect all of the baubles and killing all of the Assassins is not required unless trying to obtain the Become the Master achievement. There is a shopkeeper at the start that sells health refills. Nice Scoop 325 Dig anywhere for a 10% chance to find buried treasures. Slingshot 250 Flings stones; requires ammo. The area behind the shopkeeper has a blue bauble (#1). Continue forward towards a Barrel and Red Barrel, jumping up on the nearby tree to reach a blue bauble (#2) If needed, use the Speed buff from the Barrel at the start to reach the bauble. Return back to the slop to get the a red and white Assassin (A-1 and A-2). Continue forward on the rainbow bridge until you see a blue bauble (#3) on your left, and jump down off the bridge to reach it. From the bauble, head counterclockwise around the hill to find two white Assassins. (A-3 and A-4) Return to the rainbow bridge and continue on again until you spot a white Assassin (A-5) by himself on a hill. Jump down and take him out, then use the nearby clouds to reach the grassy platform in front where another white Assassin (A-6) can be found as well as a blue bauble (#4) hidden in the corner. Use the Speed boost found in the nearby barrel to jump to a nearby dissolving cloud and then quickly jump to the grassy area ahead. Head up the hill, and climb up the tree to find a blue bauble (#5), then look down to your right to find a white Assassin. (A-7) Run up the hill towards the first checkpoint to find another white Assassin (A-8) and a blue bauble (#6) resting on a tree branch. After the first checkpoint you will find two red Assassins(A-9 and A-10) on the ground level of a small pagoda and one red Assassin on the second level. (A-11) Use the nearby trampolines to get a blue bauble (#7) at the very top the of the roof of the pagoda. Moving forward, the 1-Up looks pretty good, but don't run straight for it as there is a Dart Trap in the structure in front of it, so instead, go around the gate using the grass area to the right or left. Continue on until you find a blue bauble (#8) as well as an Infantile Cloud on your left and a path with a Red Barrel on your red. Head to the right, using either the Mini Bomb or slingshot to explode the barrel if you can't reach it with your stick/chain stick. You'll come upon two Assassins, one red and one white (A-12 and A-13), and after dealing with them, climb to the very top of this hill to get to another white Assassin. (A-14) Climb up the tree where the owl spawns at and jump across to get the white Assassin (A-15) located on the adjacent hill. before using the Flower Launcher to the pagoda. Return back to the hill, and use the Flower Launcher to launch you to the roof of the nearby pagoda in order to reach a blue bauble. (#9) Drop down from the roof to find a red Assassin (A-16), and if you have a key, use it here for the chest inside the pagoda, otherwise ignore it for now. Drop down to the floor below to find two white Assassins (A-17 and A-18), and then drop down again to find a red Assassin. (A-19) Drop down the pagoda one more time to find two white Assassins. (A-20 and A-21) and then use the nearby tree to climb up to reach the adjacent hill a white Assassin (A-22) and a blue bauble. (#10) Return to the rainbow bridge and use either the mini bomb or the slingshot to get a purple Assassin (A-23) hanging out up on a high hill. Hit the second checkpoint to find a red Assassin (A-24) as well as four pools with Piranha that jump back and forth across. A barrel found to the right of the checkpoint may help as it contains an Invisibility buff, and make make dealing with the Assassin easier as the Piranhas jumping from the pools will not hit you. The area below it is a platform with two more red Assassins (A-25 and A-26), as well as another pool with a Piranha and several trampolines. While you do not need to feed the Octopus in Infantile, if you wish to do so, wait close to the pool and dodge the Piranha as they jump out, attacking it in order to pick it up. From there use the trampolines to jump up to the Octopus and feed it the Piranha, repeating two more times per party members in order for the platform to be low enough to jump to and access the next checkpoint and area. Hit the third checkpoint and continue forward to find a white Assassin. (A-27) Head up to the grassy platform where he was located, make your way clockwise around the hill to find a blue bauble(if you pass a toad, you've gone too far). (#11) After getting it, head back to the main area and climb up to the top of the hill to find a white Assassin. (A-28) After dealing with him, continue forward again towards the next Infantile Cloud, but instead of using it or the Flower Launcher, head to the right and carefully jump on the dissolving cloud to the grassy area, and use the Glove of Wisdom to push the Block up against the tree. Jump up the tree to where the Shortcut Eagle is located and to a blue bauble (#12) in front of him, but quickly jump up away from the eagle(you don't want to use it just yet), and jump up to the area above the eagle and use a bomb to reveal Hidden Room 1(Bachelor of Secrets: In the middle of the trees). Wooden Whistle 250 Plays three notes. Nice Scoop 325 Dig anywhere for a 15% chance to find buried treasures. Purchase a key here and go back to the Pagoda and unlock the chest for a red bauble (#13). Return back to the area before the Shortcut Eagle, and this time continue forward on the rainbow bridge until you spot a blue bauble (#14) sitting on top of a tree on your left. Drop down and pick up, then drop down to the bottom of this small area to find a white Assassin. (A-29) Climb up the tree and back to the rainbow path for a short bit until you see an area on left with lots of tree branches and a red Assassin. (A-30) Jump back on the rainbow path and continue forward towards the fourth checkpoint to find two white and one red Assassins. (A-31 through A-33) Hit the checkpoint, but do not enter the pagoda, instead, turn around look for a Flower Launcher to area below on the right. Take it to find a blue bauble (#15), then take the next two Flower Launchers to find Hidden Room 2(Bachelor of Secrets: Travel by flower). Upon leaving the shop, simply jump into the abyss to return to the checkpoint. Medium Health Bottle 300 Health refills restore two hearts. Enter the pagoda to find the mini-boss Assassin. (A-34) He can only be damaged when his glove is down, and the two nearby Barrels may provide some help in dealing with him, with the right Barrel having a Speed buff and the left Barrel having some food inside. After defeating him, push the nearby Block to the trampoline and jump up to the second level of the pagoda where two white and two red Assassins (A-35 through A-38) are located. After dealing with them, head to the center of the floor, and carefully jump to the ledges to reach a blue bauble (#16) and then continue outside using the Glove of Wisdom to find one more red Assassin. (A-39) Jump onto the nearby clouds and reach the area with the large bell. Ring the bell by pushing a log from one of the poles in order to lower the wooden bridge behind the checkpoint, then hit the fifth checkpoint. 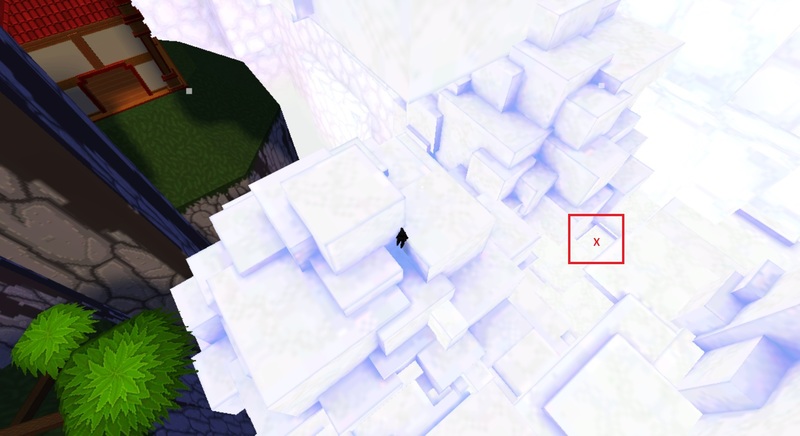 In this area, as a side note, if you are working on Master of Decor, World 2 , take the cloud short cut to kill the Assassins and then stand on the (A Fluffy Trap Door) fluffy trap door . One must jump once the cloud crumbles to fall through to the shop. There is a spinner flower and a bouncy mushroom to get you back up top. From the checkpoint you'll find a red Assassin (A-40) running around in front of several openings at the base of a large pagoda. After dealing with him, head to the last opening on the right-hand side but do not enter it, as there is a Dart Trap overhead. Instead carefully use the Glove of Wisdom on the block found in the archway, then enter the pagoda via the opening that is second from the left(the only safe entrance) and push the block until it locks into place in front of a doorway with Dart Traps on the side. Jump up on the block, and over the Dart Trap to find another Block that you must push, and again, use it to jump over a Dart Trap in the doorway. Carefully use the trampoline to jump up and over towards the ledge of the upper level of the pagoda, as there are Dart Traps on all side of doorways. Carefully push the blocks with the Glove of Wisdom until they have all locked into place(refer to map at side) allowing you to safely use the trampoline in the middle to get a blue bauble (#17) and to reach the top level of the pagoda. The top level has a red and white Assassin (A-41 and A-42) as well as Toad who will likely try to inhale you as soon as you reach the top, so be careful of him. There is also one more white Assassin (A-43) hiding in the small corridor near the grey panel with what appears to be a Glove icon, either attack him with the stick/chain stick through the walls or lure him out with the whip. After hitting the sixth checkpoint, make a left and head towards the clouds near the corner of the building. Use the smaller clouds (the larger one dissolves) to reach the roof of the pagoda, then head towards the wooden framework that supports the bell found before Checkpoint 5. Carefully jump onto this framework and at the end of each corner, you'll find a blue bauble, for a total of 7 baubles. (#18-24) From there go to the 3rd beam from the left(facing away from the pagoda you just left) and use the dissolving clouds there to quickly jump onto the pagoda directly in front of you to pick up two more blue baubles on its rooftop. (#25-26) Return to the 6th checkpoint and this time head right from the checkpoint. If you have Mini Bombs, use them to easily take out the purple Assassin (A-44) below, otherwise jump down, but try to stay out of range of his weapon. Once he has been defeated, the bridge will lower to the next platform to reveal another purple Assassin (A-45), and you can either use the Mini Bomb or the Sling Shot to take him out from a distance or melee him while trying to avoid his weapon. A third bridge will lower to reveal the third purple Assassin (A-46), and if you are quick enough, it is possible to take him out with Mini Bombs before he sees you, but either way, take him out to lower the bridge to reach the pagoda in front of you. Jump up on the little structure in the middle of the platform to reach the bridge(try to be quick in doing so as the Piranhas jumping from pool to pool may knock you down), and you will encounter two white Assassins (A-47 and A-48) hanging out in front of the pagoda. Try to avoid fighting them in front of the doorways as Piranhas from the nearby pools are likely to jump out at you causing you additional trouble(hence the pagoda's name of Piranha Pagoda). You will need to feed another Octopus, but before doing so, clear out the two red and two white Assassins (A-49 through A-52) on the second floor, and the three white and one red Assassin (A-53 through A-56) on the third floor as then it will make feeding the Octopus much easier. Use the clouds found at the rear of the building to reach the second floor, the trampoline to reach the third floor and the clouds again to reach the roof to feed the Octopus. After the Octopus has been feed 3 fish per party member, head to the roof again, but head in the opposite direction to hit the seventh checkpoint. From the seventh checkpoint, head towards the hill to find a red Assassin (A-57). Bomb the area he was standing on and drop down into the hole to find Hidden Room 3(Bachelor of Secrets: Past the piranha pagoda). Medium Health Bottle 300 Restore health. Use a Mini Bomb on the wall directly behind the Shopkeeper to reveal an opened wall, and enter it for Hidden Room 4(Bachelor of Secrets: Alternative shop exit), then return to the shop and purchase a Key. Exit the shop via the trampoline and head back to Piranha Pagoda and get onto the roof, heading towards the front section to find a chest with two red baubles inside. (#27-28) Return back to the seventh checkpoint and either jump from the thin poles or the clouds to reach an area where a white Assassin (A-58) can be found on top of a cloud. You will need to use either the Sling Shot or Mini Bomb to get him as the cloud is too far away to jump to. Continue jumping from pole to pole until you reach the eighth checkpoint. Either use the boost from the checkpoint or jump to the bottom floor of the pagoda in front of you where two white Assassins (A-59 and A-60) are likely waiting for you. Use the small object found on the right corner to jump to the nearby tree, and jump down below to find a white Assassin. (A-61) Climb up the tree to reach the second level of the Pagoda where a red Assassin (A-62) can be found. From here you can either use the Glove of Wisdom to break open the panels and use the trampoline on the first floor, or feel free to climb up the tree again to the third floor to take out a red Assassin (A-63), but from there you will need to climb the tree and jump to the top floor to find a white Assassin. (A-64) Use the Glove of Wisdom to reveal a room with 6 Toads. While the Speed buff in the nearby barrel may allow you to avoid being inhaled by the toads, you will likely have to kill them all by either using the Sling Shot or Mini Bombs on them if you want to get the blue bauble (#29) safely. If you are going for Become the Master at the same time, you will simply have to subtract 6 from your total score, and as there are Dart Trap near the toads the bauble can be reached safely by hitting it with the Whip from the side of the room. Exit the room make a right to find a white Assassin (A-65) on the outside, but try to hit him from a distance or lure him away from the side of the Pagoda as he is usually located next to a Dart Trap found on the outside wall of the pagoda. Jump up the nearby tree to reach the ninth checkpoint. In front of the ninth checkpoint is the tallest, and deadliest pagoda in Pain Cliffs and has a large gong located at the top(often referred to as "Gong Pagoda"). On the first floor of the pagoda are two red Assassins (A-66 and A-67), the first of which will be waiting by the checkpoint, with the second one usually running over to you a few seconds later. After taking them out, head clockwise around the building to find a blue bauble (#30) located just before a Block. Push the Block with the Glove of Wisdom to avoid being hit by the Dart Trap there, and go around it and back to checkpoint nine. Jump to the roof the pagoda that had the toads to pick up two blue baubles (#31-32) on the roof. Drop down to where you originally exited the toad room. Head left from the toad room exit to the end of the wood pathway and drop down to the grassy area below. Use a bomb in the little nook under the pathway behind you to reveal Hidden Room 5(Bachelor of Secrets: Below the deadliest pagoda). Chain Sticks 400 Sticks connected by a chain; has longer reach. Return to where Hidden Room 6 was a third time, but this time use the Flower Launcher to be thrown to a grassy area, and then head straight ahead until you spot some Hillbillies. Wait until the Raccoons appear to steal baubles from them and follow them through the maze to where the Raccoon Kingpin and the Stump are. You do not need to take them out, instead bomb the patch of darker grass found to the left shortly after exiting the maze to reveal Hidden Room 8(Bachelor of Secrets: Near the raccoon hideout). Drop down into it, and carefully jump from rock to rock(using the Torch or Candle will help to see as parts are a little dark) until you find a Mysterious Stranger. In front of him is a rock with a small flower on it, jump to it and click the option to "Contemplate" it, which will teach you the Gatekeeper Lullaby on the Wooden Flute. Use the song to open an nearby wall and Hidden Room 9(Bachelor of Secrets: Use the wooden whistle) with a purple bauble (#35) in it. As the only way to exit the area is to die, either dig up a Bunny or jump into the Improper Water to return to the ninth checkpoint. If you are not doing "Become the Master" achievement requiring you to kill all the Assassins, you can simply head to the back of the building, and jump to the Bonsai Pot and then jump to the pathway to reach the tenth checkpoint. If you are trying to get all of the Assassins however, you will need to head inside the Gong Pagoda and carefully make your way to the top. Move slowly, moving your camera around in order to spot Dart Traps, as the obvious path is the deadly one and you will often have to jump up the ramp from higher up rather from the bottom to avoid being hit by Darts. There is one white Assassin (A-68) on the second floor, one red and two white Assassins (A-69 through A-71) on the third floor, two white Assassins (A-72 and A-73) on the fourth floor, two red Assassins (A-74 and A-75) on the fifth floor, and four white Assassins (A-76 through A-79) on the top floor. After clearing the Pagoda, head to the back to the ninth checkpoint, then head to the rear of the building and head to the nearby pathway by leaping to the Bonsai Pot and then to the pathway where you will find a white Assassin. (A-80) Continue further down the path towards the tenth checkpoint and you will encounter two red Assassins (A-81 and A-82) just before you reach it. If you are trying to collect all of the baubles, jump off the edge to return to the tenth checkpoint and then run all the way back to the Shortcut Eagle(found just after the third checkpoint), and this time do take him. If you are not interested in bauble completion, activate the eleventh checkpoint, and if you aim your jump carefully, you will land in the area above which is Hidden Furniture shop(Master of Decor, World 2: All together now!). If you miss the checkpoint jump, you can also access the furniture shop by jumping from the first trampoline onto the clouds and then into the shop. From there carefully jump from pole to pole until you reach the area with clouds and pools of Piranha. Do not linger on the clouds too long, as some will crumble and the Piranhas will jump out of you so make your way up quickly past them to an icy area. From there jump to the dissolving cloud below and then to the snowbank across from the cloud. You can either climb up to the top for the thirteen checkpoint, or use clouds found near the twelfth checkpoint to reach the clouds before it in order to get the remaining Assassins as explained below. The eagle will drop you off on top of a wooden structure where there are 5 blue baubles (#37-41) at each end. This area introduces icy surfaces which can cause players to slide off platforms if not careful, whereas the snowy platforms that appear here as well, will not cause players to slip. There is another large bell here that must be rung, so head to a pillar to push the log with the Glove of Wisdom into the bell causing the wooden bridge behind the checkpoint to lower. Hit the final checkpoint. If doing on Infantile, be careful around the checkpoint right before the final zone. Players have been trapped in the rainbow clouds after activating it, type /gg in chat to respawn. Going even further back towards checkpoint 5 (or coming from checkpoints 5 via the cloud shortcut), shortly after reaching the cloud passage (from checkpoint 5 towards checkpoint 13), stand on the small patch of crumbling clouds to find the shop. Return back to the thirteenth checkpoint, and pick up the final blue bauble (#42) on the wooden walkway and then head up the icy hill. Destroy the Cage on top the icy hill and save the villager to complete this area and the zone. A total of 330 baubles can be dug up in Pain Cliffs per day. (50) Just before the first checkpoint, head to the right and jump down to a small ledge. (20) Past the first checkpoint, climb up the tree opposite the pagoda and from there jump to the flat hill area directly across. (50) Right before the fourth checkpoint, drop down to the grassy areas under the house and head clockwise around to the back. Dig on the flat landing right before the narrow strip. (50) After the seventh checkpoint, cross the bridge and bomb the top of the mountain to reveal a hidden shop. Inside, throw a bomb into the area behind the Merchant to open up a "back door". Right outside the opening is the dig spot. (50) After the eighth checkpoint, use the trampolines and/or tree branches to get to top of the pagoda tower. Just before crossing the small bridge, jump down to the grassy slopes below, and move forward along the narrow cliff edge and around the corner. Short jump to the short broken section of cliff ledge and dig. (20) After the ninth checkpoint (on the bottom ledge of the huge pagoda), go to the left side of this pagoda, and use the trees and the small upright pagoda points to jump to the 2nd-from-the-top pagoda ledge. From there, move around to the other side of the pagoda and use the clouds to jump to the roof. Run across to the other side of the roof and jump from the pagoda point in the corner across to the cliff. Use the spinning flower to be thrown across to the mountain. Run along the side of the mountain to find two hillbillies below a cave. Dig on the ledge below the cave. (20) (Same as above) After ninth checkpoint, make your way to the top of the huge pagoda, and jump across to the cliff. Use the spinning flower to be thrown across to the mountain. Run alongside the mountain edge and run passed the hillbillies to the right (towards the Raccoon Kingpin). Upon entering the tree maze, take the first right and follow it all the way to a dead end and dig. (50) After the eleventh checkpoint, there are at two Red Barrels sitting on poles, one close to the checkpoint and one a further away. Head to the pole with the Red Barrel furthest away and dig on that pole. A carefully aimed Mini Bomb can clear the Red Barrel if you are worried about it. (20) After the final checkpoint, dig under the wooden walkway. If you are going for the Become the Master achievement, use the Team Score in the top right corner to keep track of how many Assassins you've killed. Be careful not to kill any other foe, as the counter will increase by one each time a foe is killed. Areas 6-9 as indicated by Baby's Second Super Adventure achievement are not unlocked by going the full route. Instead, take a detour on the right of the building after the fifth checkpoint to hit these areas. In the 2017 update, dart traps outside of Tribulation Mode deal damage and cause a knockback, but do not kill on contact. Lag may cause traps to knock characters onto the opposite side where they are not supposed to be. This may cause issues with progression and force the character to respawn by dying to additional trap damage. There is an object that can be seen, but not reached, in a small corridor found near sixth checkpoint. Players are not able to access it at this time, as the nearby block cannot be destroyed, and while some were able to reach during the initial release of World 2 in 2013 as well as in 2017, it wasn't coded to do anything at the time so it's current purpose is unknown. This page was last edited on 17 April 2019, at 00:17.